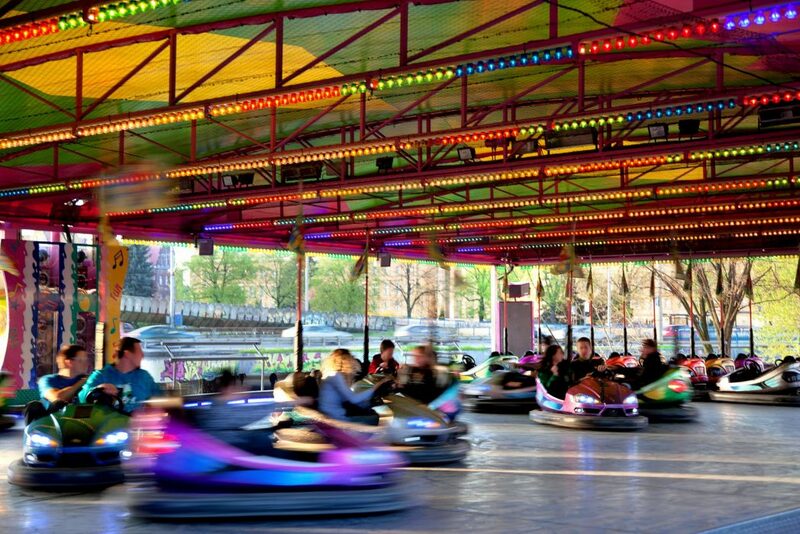 The dodgems hire or bumper cars as they were previously known as are the most popular fairground rides around. Each player gets in their electric powered dodgem car, and when the siren goes, they ride around the track trying to avoid the other cars. It doesn’t really matter if you crash as the cars all have a large rubber surround on them. With the ”dodgems hire”, there is a great sensation for all the riders, there is the thrill and excitement of near misses / crashes and shunts from behind. We hire dodgems to many clients and they are always re-booked as they are in constant use throughout the duration of the event. The dodgems hire is great, and will be the centre piece of your event. The great thing with the dodgems hire is that the children and adults can use them together, and they are great fun. It doesn’t matter really how good a driver you are, you can still be side-swiped by those drivers out for a bit of fun. The dodgems for hire are the most popular corporate fairground rides. We hire dodgem cars and hire bumper cars throughout the UK to a wide range of clients from University balls to company fun days. The fair ground hire is very popular in the summer months. The funfair ride hire is great for all ages and always very busy. The fairground ride hire is a great attraction at events and when you get the right rides your event will be a success. Our funfair hire is a great attraction at events. With the fun fair hire most clients also have the fun inflatables and other games to add to the event. We hire fairground rides and hire funfair rides to a wide range of clients. Dodgems hire is available throughout the UK and they are always in demand. The dodgems are a great piece of equipment for every event from Balls to parties, fun days to weddings. There are the fold up dodgems which are trailer mounted, drop down the sides, level up and they are ready to go. And also, the hand built tracks, suitable for indoors venues or where access is a problem (obviously, these are more expensive – but always an option). The dodgems hire is great fun and will keep large numbers of guests occupied at your event.